What’s ‘Inside the termite mound’? Not all types of ground-nesting termites build mounds. 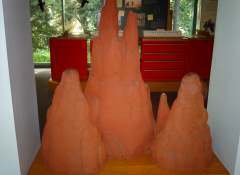 The only termite mounds of note in North America are either fossils or models. But mounds are common in Africa, SE Asia and South America. Architects increasingly like termite mounds. A big mound may house a million of more termites in relative comfort. Coptotermes lacteus, which I studied for many years, can keep the temperature deep in the mound where the queen and eggs reside stable ± 1°C over a whole day, throughout the year. That’s better than commercial air conditioning. They do it mostly with evaporative cooling, solar collection, lots of thermal mass and, in the depths of winter, huddling to share metabolic heat. They don’t keep a set temperature, but have a very graceful temperature curve, allowing gradual change between the seasons. Mounds are a huge investment of energy and resources. To build a mound, a colony must have a long-term supply of good food nearby. It must also be large, since many termites will spend their time maintaining the mound rather than feeding and these will need to be fed. Some of the largest and most spectacular mounds in Australia are built by termites that feed only on grass. The “magnetic mounds” around Darwin are the best known, but the much larger “cathedral” mounds of Nasutitermes triodiae are equally spectacular. Compare the height of the one pictured here with Don (white t-shirt and suffering the Spon). Both these mound types allow the termites to live in swampland and store food to be used during the long wet season. But not all grass-eaters’ mounds are tall. Drepanotermes which live in the dry inland country down to NW Victoria build wide flat mounds known as “platforms” which often look like slightly-domed patches of bare earth. In Africa and SE Asian there are many types that grow big, obvious fungus gardens in their mounds. Macrotermes and Odontotermes are the best known. But fungi and bacteria are present in all mounds and it is likely that most other mound-building species are also farmers of some sort (or are themselves being farmed). We could talk about mounds for days on end without exhausting the features and interests of the various forms. 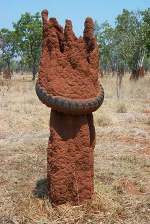 Bookmark this article What’s ‘Inside the termite mound’?